Walk in and paint what you want when you want! Any time we are open, even during events, you can come in and paint Canvas, Wood Pallet Signs, Board Cutouts, or Ceramics. No reservations necessary! However, if you have a group of 6 or more, reserve a table for your group online under Parties & Events. For Canvas, you can use our step-by-step paint sheets that guide you through each painting using pictures and words AND we always have an artist on staff to help you when you need it! Choose from our 10 sizes of canvases to fit your personal needs. For Ceramics, you can paint them with Glaze for food safe items and pick them up in about 10 days after we fire them or if it's a figurine, not needing to be food safe, paint it with our Acrylic paints and take it home the same day! Just grab a can of Acrylic Clear sealer and it will be shiny and water resistant. 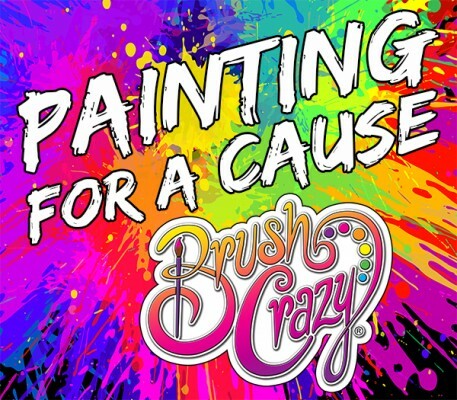 There's no better way to celebrate a special occasion than a Brush Crazy paint event! If you would like a painting taught step by step here are some options. Check out our weekly calendar to see if you want to join a class offered there. If so, click on the painting you want to join and follow the steps to register and pay online. If you have our current rewards program, it will show you your balance. If you want to have a class added to our calendar, just get at least 10 people together, contact the studio to set it up on the day and time you desire. If you do not already have one of our paintings in mind, we will help you decided. If you can get at least 10 people together, we will even add a class to a day we are normally closed! Disclaimer: If there are less than 4 paid people for an event class, it my be changed to Open Paint where we will still help you and/or your group create a great painting! *What size canvases do you offer, and how much do they cost? *What size wood pallet signs do you offer, and how much do they cost? We have 30+ different wood pallet signs starting from $15 going up to $65. *What if I have trouble drawing a stick figure? Luckily, none of our paintings include Stick Figures. Plus, we have talented staff that can help you to achieve a unique piece of art. Our goal is for you to have fun while exploring your artist side. *What is included with the price? We provide the canvas, wood pallet signs, plywood cutouts, ceramics, paints, aprons, instruction, plastic cups, napkins, plates, and bottle openers. You go home with your project and great memories! *What freedom do we have during a step-by-step class, can we change colors? Even though our instructors will be teaching the painting one way, feel free to change it up however you want in color, style and icons! How many plywood shapes do you have? *What is the age minimum to paint a canvas? Step-by-step painting classes are offered for ages 7 and up. Evening classes are recommended for 18 and older, as participants are allowed to bring alcoholic beverages. Walk-In Open Paint does not have an age limit. If bringing younger children, please be respectful of the customers around you, and keep your children with you at all times. *What types of payment do you accept? We accept Mastercard, Visa, Brush Crazy Gift Cards and cash - please no checks. *How do I register and pay for a class? You must sign in or create an account before registering for a class. If you already have an account, sign in before registering. 1. While viewing a class, use the red box on the right to sign in. 2. Click on "my account" at the top of the screen. After signing in you must go back to the class to register. Click "create account" in the red box or "my account" at the top of the page. On the left side of the screen, complete the entire form. If you would like to opt in for email updates with special offers, email receipts detailing paint money earned and available rewards, and text message updates with special offers, make sure the check boxes are selected. Click on the calendar link to view the entire calendar, or the agenda to view in a list. Find the painting you want to create and click on the image for class and painting information. From there, just follow the registration process. How to register for a class. From the options available, select the number of painters from the drop down. In painter details, add the name of each painter. If you want to use your reward balance, check box "Use my reward cash balance." To use a gift card, enter the gift card number and amount. Include special request, if any. This takes you to the payment page. Verify information in the form and add credit card information. You will receive an email receipt and be taken to a receipt page to verify registration. Please arrive 10-15 minutes before class and bring your email confirmation on your mobile device, or print it out. *When scheduling a class; what if I need to pay with cash? Please call the studio to make arrangements, or come into the studio and pay 15 minutes before the class starts. Keep in mind only paid spots are guaranteed for the class, if the class fills up before you come in to pay, there may not be room for you. *Are we allowed to bring in food and drinks? Our studio is BYOB! Feel free to bring in your favorite beverage (alcoholic beverages are limited to beer and wine) and some snacks to enjoy during class! You may have food delivered, or even catered for larger events. Remember you are painting most of the time, so finger foods are best! We recommend adult beverages after 6pm. Please bear in mind that if anyone or any group gets disrespectful to others around them with language or intoxication, they will be asked to leave the studio. Inappropriate language will never be permitted. This is a family friendly studio even in the evenings with mostly adults - thank you ahead of time for your cooperation. **Painters must be at least 21 to drink alcohol at the studio. Please drink responsibly. *Do you have "Walk-in Open Paint times" to paint what we want? Yes - anytime the studio is open, you may come in and paint canvas, wood pallet signs, board cutouts or ceramics. We will provide the project of your choice, paints or glaze, apron, step-by-step paint instruction sheet, and guidance from one of our artists! Please register on line ahead of time for more than six people, and we will reserve a table for you! *How much are painting classes? All prices are based on the size and type of project selected. A two hour step-by-step class is the same price as Walk-In Open Paint on any project. Paint your pet has a $20 sketch fee. Pouring art has a $10 fee. Bubble art has a $5 fee. *How much notice do I need to give if I can't make it to a class I've paid for? Cancellations of a class under 24 hours in advance will not receive a refund. Cancellations received the day of a class will receive Paint Money gift card. No-shows for class will forfeit payment. *What do you provide for the BYOB classes? We provide a corkscrew for you to use. You need to bring anything else that you might want, including snacks and/or cups. You must be 21 years of age or older to consume alcohol. You will be required to sign a waiver to participate in BYOB. What is the BYOB waiver? To keep everyone safe and informed a waiver has been added to the registration process. "I agree that I am 21 years of age or older and will consume my alcoholic beverages responsibly. I release and waive any and all claims or action that may arise against Brush Crazy, its affiliates, successors, as well as the owner and employees/contractors as a result of anything which occurs before, during or after my session including to but not limited to injury, loss, theft or damage to any person or property." *Do I need to bring anything to the class? Nope. We provide all materials for your art project. All you need to bring is a good and fun attitude! We do suggest wearing something that you don't mind if it gets paint on it. We do provide aprons, but there is no guarantee paint won't find it's way on your clothes. *Why is the staff taking pictures? Photos may be taken during your time in our studio. They may be posted on our website, social media, or used in advertising. Please let us know if you DO NOT want you or your child in those pictures. *How do I earn free classes? We currently have an electronic rewards program. To create an account or sign in, click on My Account. 1. Earn points every time you come in to paint! 3. Check in at Brush Crazy on your Facebook page every time you paint with us! 4. Refer a friend by sending them a link from your social media profile. When they come into the studio and make a purchase, then you will automatically receive more points on your account! Earn 350 points get $35 to use anyway in our studio. No cash value. If you register your birthday month when you sign up, we will send you an e-mail letting you know we loaded a gift to your rewards, and you can redeem it any time during your birthday month! Once a month, we will host a Painting for a Cause fundraiser and donate 50% of the proceeds to the cause being supported. See the Fundraiser page or call your studio for more information. We also do Walk-In “Open Paint”, Painting for a Cause fundraisers a few times a month, in which a group can come in and receive 20% of the proceeds towards a charity or cause. Paint Your Way To Fun!